The princess life is one that every little girl dreams of, so what if we told that you could bring a little aspect of that lifestyle to your daughter every night? 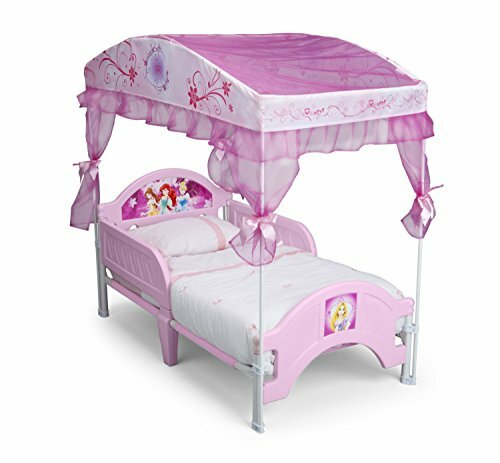 The Delta Children Canopy Toddler Bed, Disney Princess is designed to look and feel like a bed built for a princess, perfect for your little princess. 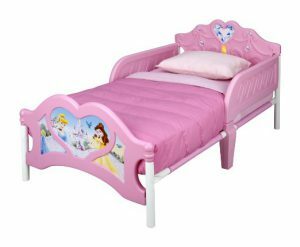 What’s more, it’s designed with Disney Princess branding in mind, meaning your child is sure to instantly recognize many of the characters featured on the bed. There’s a lot more to love about this little bed, so read on into our review to find out more. So what’s so great about this Delta Children Canopy Toddler Bed? There’s a number of features that make this bed great including the aforementioned princess design. As we’ve already mentioned, this pretty pink bed is designed to look and feel like a bed that a princess would sleep in. This image is helped by the fact that the bed features its own canopy. This canopy is supported by four posts, making this look and feel like a traditional four poster bed. As we’ve already mentioned, the bed features a Disney Princess theme too. Your child is likely already more than aware of the Disney Princess branding, it’s become a consistently popular range of characters amongst children. You’ll likely find that your child recognising the branding on their bed should make bedtimes that bit easier. We should add that the branding used here is subtle, but you can recognise the characters across the bed. Couple this with some Disney Princess sheets and it will look absolutely fantastic. It’s nice to see that the canopy and side rails can be removed from the bed, meaning it’ll still be the perfect sleeping solution as your child gets older. Chances are, they might grow out of the princess theme pretty quickly, but Delta Children have you covered. It’s also worth mentioning that the bed works with any standard crib mattress, meaning you’ll be able to use your current one or find a new mattress without much trouble. As with most products offered by Delta Children, this bed will require a fair amount of assembly. The bed will come in a flat pack form that requires an adult to assemble. Many customers have claimed that this process can take a little while. Q: What comes with it？What size mattress does the bed fit? A: yes, it comes with canopy curtain, rods, picture stickers and bed frame only.It fits a regular crib mattress. Q: Where is it made of? Q: What’s the dimension of it? and is it heavy? Q: What age is appropriate to use this bed up until? A: 2-5 years old(deponds the size of your princess). The above product provides a fantastic option if you’re looking for the full princess experience with your child’s bed. However, we’ve also picked out an alternative option if you don’t quite has as much money to spend or you’re looking for a slightly more subtle use of the princess theme. That product is also from Delta Children and it’s the 3D Footboard Toddler Bed Disney Princess. It’s largely similar in nature to Delta Children’s other product, in the respect that it uses a sturdy metal frame and other high quality building materials. However, as we aforementioned, the bed is actually cheaper than the other product. Because of this, you can expect to lose out on a few features, including that princess canopy. We’d still have no trouble recommending this bed from Delta Children, but if you’re looking for a complete princess experience and have the money to spend, go for the former bed. In conclusion, the market for Disney Princess themed beds is a pretty crowded one. There’s plenty of great options out there, but we feel this one does the best job at providing the ultimate princess sleeping experience. The added canopy is a great feature and something we haven’t seen from any of the other products we’ve reviewed. Copyright 2018 CoolToddlerBeds.com, All Rights Reserverd.